I’ve got 300+ GB of photos and videos sitting on a couple hard drives. I never look at them. I’ve never found the time to organize them. They just sit there. The new Google Photos claims it can fix that. It’s like Gmail for your photos, the company whispers. You know what? It’s the rare pitch that’s completely true. Just like Gmail in 2004, Google Photos is a gamechanger. Just like Gmail, it’s so good today that I’m willing to ignore the price I might pay tomorrow. 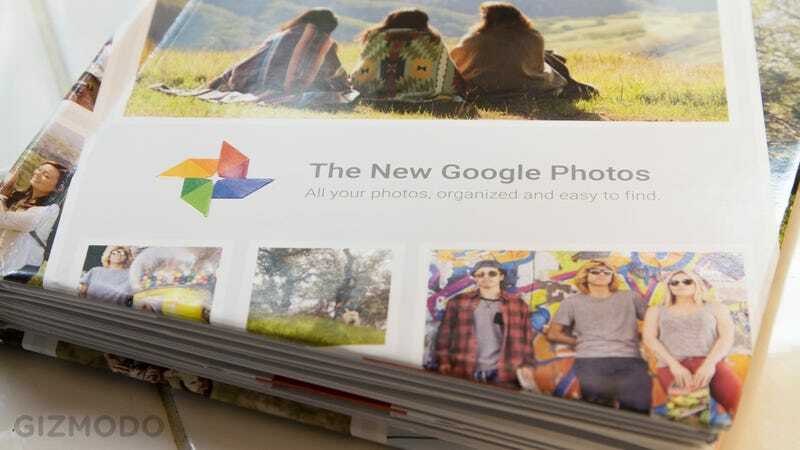 Last week, Google announced it would offer free unlimited photo and video storage to everyone with Google Photos. Gmail was the obvious comparison. In 2004, Gmail it offered a whole gigabyte of free email storage back when competitors only offered a few megabytes, and cemented its place in history. The invitation-only service was so popular that Google had to stop people from selling accounts on eBay. It boasts 900 million users today. But storage wasn’t the only reason Gmail became such a killer app. It was smarts, too. “I remember the day when I used to be a filer, when I would tediously drop every email into a folder,” Google’s Bradley Horowitz reminsces. “Then the world changed.” Gmail turned emails into threaded conversations, and let you search your inbox for anything you needed. Google Photos has similar smarts: the uncanny ability to computationally figure out the who, what, when, and where of all your pictures—no tagging or sorting required—and, again, the ability to let you simply type in keywords to find something you want. Search for dogs, you get dogs! As demonstrated by a pop-up book Google handed out at I/O. So of course Google would sell the Gmail comparison hard. It’s a great analogy, and proof that hundreds of millions of people trust Google with their private data. It was enough for me. I’d seen what Google Photos can do. And more importantly—much like when I switched to Gmail—I’ve got nothing to lose. Those photos are just sitting on hard drives. Who else will help me sift through? “You almost need a second vacation to go through the pictures of the safari on your first vacation,” Horowitz recently told Steven Levy. That’s how I feel too. Sure, there are other services that could help me back up my 300GB of photos, stick ‘em in the cloud, even share ‘em with friends—for a fee. I pay for Amazon Prime, which means I’ve actually already got unlimited photo storage if I ever feel like taking advantage. But I don’t, because I’d just be moving my disorganized memories from one place to another. Honestly, I’ve never even bothered to check what would happen to my photos if I ever stopped paying for Amazon. Now, I don’t have to. I have 28,000 pictures and videos uploading to Google Photos right now, because the combination of free and unlimited means I never have to worry about things like that. Like Gmail in 2004, unlimited storage is the enabler. Then, in exchange for access to those memories, I’m finally able to browse these photos in logical ways. The fact that Google can automatically create animated GIFs and albums from my memories is just the cherry on top. Mostly, I want to easily recall my memories. I’ve never been so ready to give a company so much of my personal data. The paper equivalent of an animated GIF—a lenticular lens illusion. Partway through my photo upload, though, I started to think about the consequences of that decision. Gizmodo deputy editor Meg Neal told me she feels that her photos are more personal than her email, and worries what happens if or when Google gets hacked. Not everyone trusts Google with their email either, for that matter! It’s a little creepy to think that Google’s robots are scouring my email to help sell ads, even if it makes those ads more relevant to me, and even if Google actually admitted that was the business model when it first launched Gmail back in 2004. In fact, if anything about Google Photos gives me pause, it’s that’s Google won’t admit how it plans to pay for all that free, unlimited photo and video storage. “We have absolutely no plan to do anything from a monetization or ads perspective,” said Google reps at a media briefing at Google I/O. In that briefing, Google stressed again and again how private and sensitive photos might be, and how important it is to earn users’ trust. The information gleaned from analyzing these photos does not travel outside of this product — not today. But if I thought we could return immense value to the users based on this data I’m sure we would consider doing that. For instance, if it were possible for Google Photos to figure out that I have a Tesla, and Tesla wanted to alert me to a recall, that would be a service that we would consider offering, with appropriate controls and disclosure to the user. It’s hard to ignore that Google is in the business of turning gigantic data streams into personalized advertising and services. That’s just what Google does. And just like with Gmail, Google’s newly proven ability to analyze what’s actually inside those photos is a double-edged sword. While it’s awesome for you and me to be able to relive memories just by typing in a keyword, imagine who else might benefit from that. What does Google do when Coca-Cola offers millions to know if its ads are showing up in your pics? What does Google do when the NSA asks to see all photos that test positive for “bomb” or “gun”? None of these worrying thoughts are stopping my photo upload, by the way. It’s at about 50% now, and I’m already marveling at the albums, panoramas, and animated GIFs that Google’s automatically creating for me, on the fly, as each new image trickles in. The photos of my friends and family at a young age, plucked from a folder I forgot I had, thanks to advanced facial recognition. The ability to effortlessly pinch and zoom into my Maui vacation. I’m hooked, and there’s no turning back. This tech is here to stay. And whether you eventually pick Google, Yahoo, Amazon, or some other company which upgrades its service to match, we’ll remember this as the moment when Google Photos changed the game.